When the Pico burned and I saw my grandfather cry, my curiosity in him grew and I wondered about who he really was. And I thought about what we’d seen when we went into his room. What did we see in grandfather’s room? Well, after all those people were taken by the cholera, it was decided that we had to give food to the king of the sea. As a child, I never knew how news reached us of the things we had to do on the island, how the adults were told what needed doing. The ministrants took the Maté Jachín out and went round the island, three laps in a canoe. They took the Maté Jachín out and went through the bush, through all the streets and the surroundings of the big village. The Maté Jachín was carried at the front, followed by all the ministrants in their white tunics and then the women who accompanied them. First the order went out that everyone had to go and wash in the lake. Then that everyone had to go and give food to the king of the lake. And finally that we had to give food to the king of the sea. I never understood who it was that gave the orders to do these things, but what I do know, from what the adults said, the female adults, is that some women on the island talked to the deads. One such woman lived near our house and was called Sabina. Actually she wasn’t just called Sabina, her full name was Maminda Zé Sabina, but anyway, she was one of the women who talked to the deads. And those women brought news of what we had to do and of what was going to happen in the future. This I know from my grandmother and other female adults. And from them I also know that most women who talked to the deads hardly believed a word the deads said. As I was only a child, this wasn’t something I could easily understand and, indeed, I found the whole thing quite frightening. Like I said, I knew Sabina and I knew she was one of the women who brought the orders of what had to be done. Although in actual fact it wasn’t quite like that: I knew Sabina talked to the deads, and that’s all I knew. I don’t remember ever speaking to her myself, but I remember she had a strange face, or at least I thought it was strange. Her face always looked as if it was about to laugh or cry, so when you saw her you thought she might burst out laughing or crying at any moment. And I say this not because I was an expert on faces and expressions but because when you’re told a woman talks to the deads and you get a chance to look at her, you look. As far as I was concerned, a woman who talked to the deads was no ordinary woman. And Sabina’s face made you think she was about to break down in tears or break out in a big smile. One or the other, at any moment. Was it because of the conversations she had with the deads? I don’t know, but what I do know, from what my grandmother and the other female adults said, is that the women who talked to the deads suffered a lot. So was Sabina’s face the face of a woman who would have been happy if it weren’t for the constant strain of having to talk to the deads? That could be it. That’s to say, if it hadn’t been for the deads always bothering her with things they wanted to convey to the village, she’d have been a smiley woman. That could be it. From what I remember of Sabina, I’d also say she was a very beautiful woman. And again, I probably say this because I looked at her a lot, because she wasn’t a she-devil. She-devils were no ordinary women either, but I wasn’t brave enough to look at them. But I looked at Sabina a lot. There were other women on the island who spoke to the deads, but I only remember Sabina, because she was our neighbour. So news reached us that we had to give food to the king of the sea, who ruled over the waves, the fish, the whole island in fact, for our island was out in the middle of the Atlantic Ocean. Was the king of the sea King Atlas? If only! What a discovery that would be! But anyway, we had to give food to the king of the sea, and during the offering ceremony there should be no one at sea, not a single canoe. And so it was announced that there’d be an offering the next day. A man went through the streets announcing what was going to take place and that everyone should assemble in the big village to witness the event. Really he announced it not so that people would attend but to make sure everyone gave something. You weren’t obliged to give anything in particular, just some of whatever you had. Extracted from By Night the Mountain Burns, translated by Jethro Soutar. Juan Tomás Ávila Laurel was born in 1966 in Spanish Guinea (now Equatorial Guinea). He is the author of over a dozen books including novels, short stories, plays and poetry. Ávila Laurel has been a constant thorn in the side of his country’s long-standing dictatorial government. A nurse by profession, for many years he was one of the best known Equatorial Guinean writers not to have opted to live in exile. 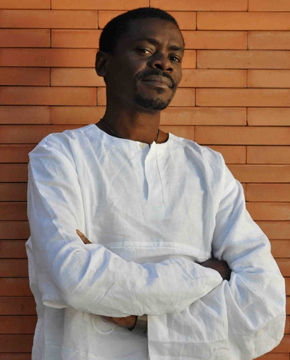 But in 2011, after a week-long hunger strike in protest against Obiang’s regime, he moved to Barcelona. 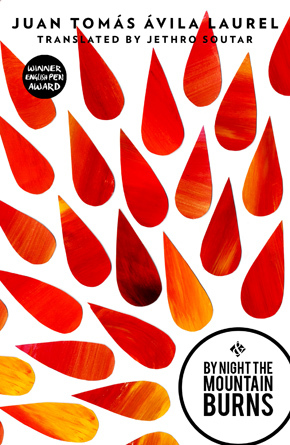 By Night the Mountain Burns, published by And Other Stories, was chosen as one of the Financial Times’ seven best translated books of 2014, and has been shortlisted for the Independent Foreign Fiction Prize 2015. Read more. Jethro Soutar has translated Argentinian and Brazilian crime novels for Bitter Lemon Press, written two non-fiction books, and recently co-edited The Football Crónicas, a collection of football writing from Latin America. He divides his time between London and Lisbon. Read Jethro’s essay on how he approached the translation.